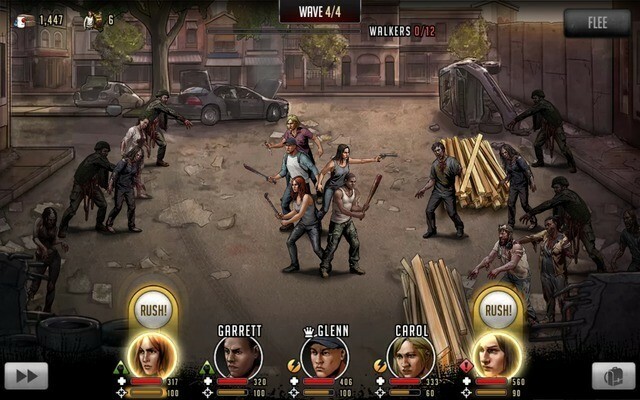 A few years ago, when Facebook gaming was quite popular, a game called AMC TWD: Chronicles became an instant hit among gamers and The Walking Dead (TWD) fans. It was fun managing survivors, equipping them with rifles, pistols and frying pans and beating the hell out of zombies in turn-based battles. Sadly, the game closed down permanently in 2014. 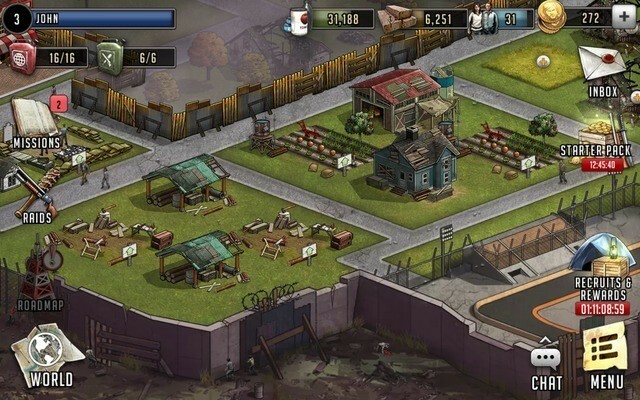 But there’s another TWD-themed turn-based available for Android and iOS platforms. Developed by Scopely, Road to Survival is an excellent turn-based RPG that also includes a decision-making system. Coming back to Road to Survival. this game has a PvP “Raid” mode that lets you infiltrate other player’s town to rob their resources. Zombie fights in story-based missions are not just plain turn-based battles. There are challenges and enemy types that will make things difficult for your ragged tag team of survivors. When surrounded by too many zombies, it’s better to leave zombie smashing to the AI. Tap on the fast-forward button at the bottom-left corner of the screen to enable auto-battle mode. In this mode, the computer decides the best way to deal with enemies. The only problem I have with auto-battle is that it uses Rush immediately when it gets activated. I save adrenaline rush for the last wave, where enemies are tougher to deal with and a boss may appear. Also, in auto-battles, the AI may not attack the closest enemy, so there is a chance of being attacked by fast-approaching zombies or the ones who are positioned closer to the team. However, in several occasions I have seen Alert team members eliminating two enemies in one shot using their long-ranged weapons. Try the auto-battle mode and if it does not suit your battle style, just tap on the fast forward button again to switch it off. A. Save your team member’s Rush for the final wave. Unless you tap on the Rush button, he/she won’t use their special attack. Once all or more than one member’s Adrenaline Rush (AR) gets activated, save them for the final wave, where there will be more enemies and maybe a boss or two. Your team member’s AR gets activated when he/she attacks or receives damage from enemies. The yellow bar at the bottom of each member’s profile screen is the AR meter. Fill it by attacking enemies and once full, use Rush in the final wave. B. Having members belonging to 4 different traits will benefit your team in the long run. Unlock at least 4 character slots and then add Fast, Tough, Alert and Strong characters (in case you have them) to all unlocked slots. When attacking enemies, tap on a zombie or human enemy to find out which trait he/she belongs to. You will see an UP arrow beside one of your team character’s portrait at the bottom of the screen. This indicates that the character’s trait is stronger than the enemy’s trait. Tap on stronger character to attack your enemy. 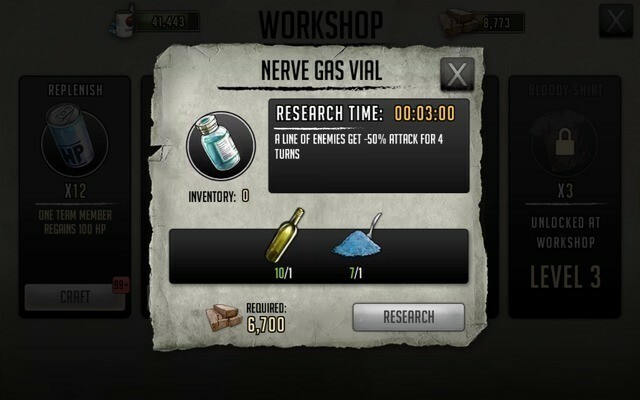 In case you don’t have all traits, train more survivors at the Training ground (research first) or recruit them by spending tokens, which can be earned by leveling up your profile. C. Your aim is to draw as much blood as possible from all enemies so that in your next turn one blow from each team member will kill them, so make sure you have the strongest team members decrease HP of most zombies or take out max number of enemies in the first turn. Both enemies have Tough traits. Your team consists of members belonging to Tough, Alert, Fast and Strong traits. When your turn comes, choose the Fast character to attack the first Tough enemy and a Tough character to attack the second Tough enemy. Do not use a weaker trait member for your attacks as it won’t harm the stronger enemy. E. Target enemies whose HP is lower than other enemies. Example: If a Tough character attacks an Alert enemy and a Strong character attacks a Fast enemy, use the other two or 3 characters to eliminate those two as their HP will be lower than others because of the extra damage they received from your stronger characters. This way you will have fewer enemies to deal with when it’s their turn to attack you. At least one or two enemies should be eliminated in every turn. This way a much smaller group will approach your team members when their turn comes. You may use all four or five members to attack individual zombies and then use the same attack sequence when your turn comes. F. Play previously completed missions to earn ingredients and gear items. You may also get an extra character after replaying some missions. Fast is stronger than Tough. Before starting a battle, tap “Enemies” and “Challenges” to know what type of enemy will attack you and what difficulties you will face while attacking enemies. These two tabs are located at the top of the team selection screen that appears just before battle. For example, if the Enemy tab says that Enemies with the Fast trait will appear in a stage, then have at least 2 Strong team members as they will deal extra damage to Fast enemies. If the Challenges section warns of Chokepoints and Dividers, then better have 2 Alert characters in your team as they can use ranged weapons to blast enemies hidden behind obstacles. For Focused Damage challenges, take Replenish with you to battle as enemies will kill those first who don’t have high health. In Healing challenges, target an enemy who is tasked to heal his teammates. In Large mob challenges, take with you battle items that can inflict area multiple enemy damage. Molotov and Tear gasses can help. You can create up to 3 teams. Tap on Roster > Edit Teams and swipe left to find empty slots for your new team. Create one team for story-based missions and another for raids. Make sure you have a strong team for raids. Take a 4 member army to raid other players’ towns. Each character has a unique “Persona”. A persona symbol (peace, cross, “A” sign etc.) can be seen on a team member’s profile picture. The symbol is located at the bottom-right of the profile picture just beside the character’s level information. There are different types of persona – Soldier, Rebel, Peacekeeper Hunter and Citizen. Using characters with the same persona as the target team member not only will award you bonus XP, but also upgrades a character’s adrenaline rush. 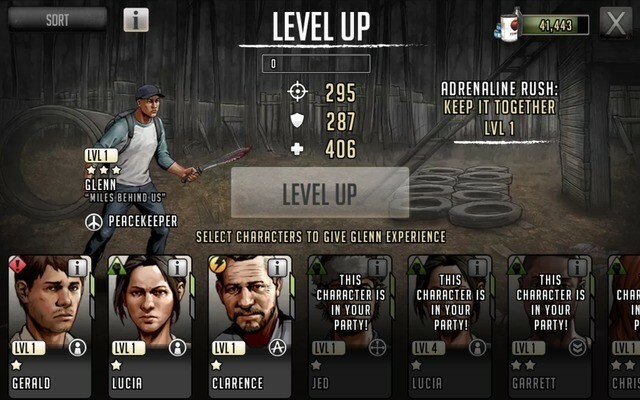 Leveling up a team member improves his key stats and boosts XP. To level up a character, you will need one or more extra characters. Your chosen character will gather experience from them. Use common one-star characters that you received in battle or via “Recruits and Rewards” (to recruit a new character, you will need tokens which can be earned when your profile levels up). To level-up a character, go to Menu > Roster. Tap on a team-member you want to level-up and then select characters that are not in your team. Make sure you select the ones that belong to the same persona. Leveling up increases HP, attack and defense stats. You will need to level up a team member by combining him with characters of the same persona type. This will boost your character’s HP and upgrade adrenaline rush. You can level up your team member via Menu > Roster. 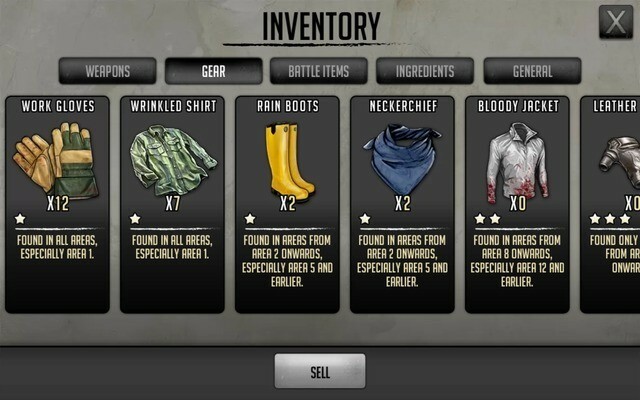 To find gear locations in The Walking Dead: Road to Survival, head straight to Menu > Inventory and tap on Gear (see screenshot above). There you will find a list of items with location hints. For example: Wrinkled Shirt can be “Found in All Areas, Especially Area 1 (HomeMart)”. Chances of earning wrinkled shirts are more if you complete stages in area 1. You will need gear items to upgrade a character. Some gear items are area-exclusive, i.e. can be found only in one area. You may need to replay completed stages to earn more gear items. A maxed-out team member must be upgraded. Upgrading a team member has its own benefits. Not only will he continue to absorb XP, but also improve his stats drastically to become stronger. Before upgrading check whether a team member has reached his/her max level. Each character has to reach a certain level before you can upgrade them. Tap Menu > Roster > Upgrade and then select a character to view his max level. Once a team member has reached his max level, it’s time to check his gear requirements. Every character has a unique gear requirement. This could be anything ranging from wrinkled shirts, neckerchiefs, jackets, running shoes to rain boots and work gloves. You can earn gear by beating more enemies and completing story-based missions. Finally, spend dog tags to complete the upgrade procedure. Build a workshop to craft battle items. These items can be used in story-based missions. When fighting zombies, tap on the rucksack icon at the bottom-right corner of the screen and then tap on the crafted item. d.Ingredients found Areas from the Prison onwards (Southeast woods and earlier areas): Booster powder, Chemical set, Metalworking set, Raw lemon. Build at least two farms and upgrade them to increase per hour food production. For example, upgrading the farm to level 3 will increase the per hour food production from 795 to 905. Also, make sure to upgrade Food storage and town hall to increase storage capacity. Sell unwanted gear items and ingredients. You may find several duplicate items and ingredients as you progress. To sell them, tap on Menu > Inventory > Ingredients and Gear tab. Next tap on the “Sell” button. Use arrows below each item to increase or decrease the number of items and ingredients you want to sell and press Confirm. Play more story-based missions and Raid random players. Upgrading Material post will increase per hour wood production. Upgrading house will increase survivor capacity. More survivors mean more battle-ready team-mates. You will need 5 or more survivors at the Training Ground to get one uncommon team member. You will also need gear items to complete the training procedure. Upgrade the Training Ground to unlock more courses for research purpose. These courses will create unique team-mates, including those who can heal fellow team mates. Build and upgrade the Workshop to unlock more crafting recipes. Most of these upgrades require wood, so make sure you have at least two Material Posts. Upgrade material posts and material storage to increase production and capacity. Fight more zombies in story mode missions and raid players to get wood. To build additional material posts, you will need to upgrade Town Hall. 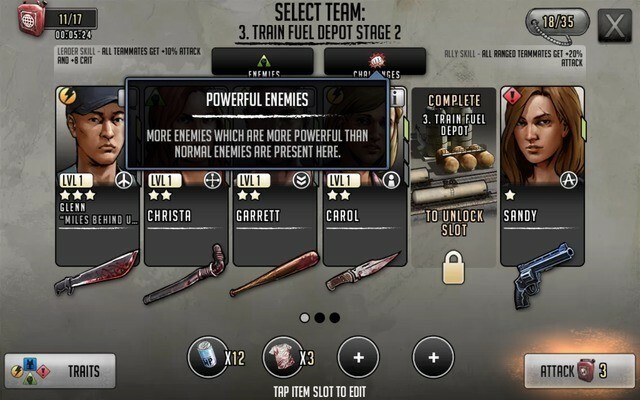 Training survivors under Weapons Training may give you two characters with the Hunter persona – Carter and Christa. Under Tactical Training, you may get Isabel, another character with the Hunter persona. Train survivors under Basic Training or Advanced Training and you may receive Jody. There are more chances of getting a Hunter character under Wilderness Training because all of 4 characters belong to the Hunter persona. In Special and Small Arms Training, you may get Timothy. 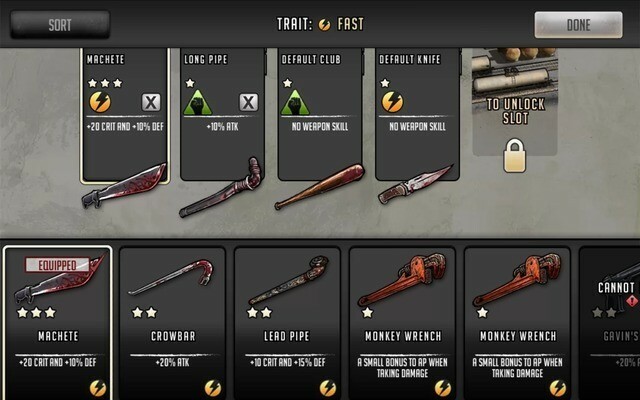 In The Walking Dead: Road to Survival, the character you will receive after training survivors is totally random, so you may receive the same character multiple times. In Weapons Training I received Georges 4 times in a row and then got someone else. Hunter persona characters are rare and so the chances of receiving them frequently are low compared to other personas. In some stages, you will find multiple enemies surrounding your team mates. A few enemies will be positioned closer to your team, whereas others will be positioned far away from your team. Each group will keep coming closer every time your team’s turn ends. Those who were positioned not too far away will keep inching closer than the rest and will attack first. The best strategy is to attack the ones positioned closer than the others. Start attacking the closest zombies right from turn 1. You may choose to attack the nearest zombies first and then plan your attack based on each zombie’s position. Finally, attack the farthest. This way no one will harm your team and will be eliminated before they attack you. Tap on a building. A menu will appear on the bottom of the screen. Tap on “Relocate” and the selected building will turn green in color. You can now tap and hold/drag to move it to anywhere you want, provided there is space available. If there’s no space, then the building’s colorwill turn red. You cannot equip any character with a weapon of your choice. A team member’s trait determines what weapon he can be equipped with. You can choose a weapon that matches with a character’s trait. Fast characters can be equipped with melee weapons like machetes, crowbars whereas Strong characters can be equipped with baseball bats, long pipes etc. Alert type characters can use long range weapons like pistols, sniper rifles and machine guns. To change weapons, go to Menu > Roster and tap on Edit Teams. Next, tap on the weapon icon below to find out what weapon a character can be equipped with. Weapons belonging to the same trait will be shown whereas those that do not match your character’s trait will be grayed out. The character shown on the player profile picture is actually the team leader. To change it, tap on Menu and go to Roster. Tap on the “Edit Teams” button. The first character profile of your team is that of the leader. To change the team leader, tap on the leader’s profile pic and choose another character as your leader. You will notice this change will also be reflected on your player profile picture. Please don’t fall for sites that promise coins. You may have been redirected from such a site. Our Walking Dead article is for those who are looking for a basic/beginner-level strategy guide and tips. That is your opinion. I try to save my rushes, especially in sr.
I’m quite new to the game, enjoying it, but I’ve got a couple of things I disagree with here. Don’t save the Rushes to the final Wave – it’s more important to know how many hits you need to gain your rushes and work on that basis. 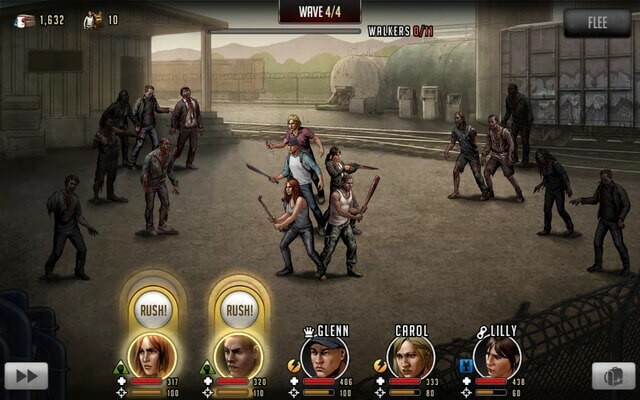 On zombie rushes in particular, try to save them so you can use them at the beginning of the second and subsequent waves to thin the herd quickly, especially when you have characters that deal damage to more than one zombie. On the first wave, use Battle Items at the very beginning to thin the herd and compensate for the lack of Rushes. Cure minor wounds to single characters with Replenish items early in the wave, wait till multiple characters are wounded before wasting a Health Rush, then try to save the rest until Waves 5 & 6. Keep the Bloody Shirts till you are down to 2-3 characters, they effectively make it impossible for zombies to attack you at all.